Delegate: Ms. Maria Olsson , Swedish Energy Agency. Key achievements in 2018 include the Swedish Energy Agency starting a new phase of its national ocean energy programme and several Swedish developers undertaking demonstration activities. 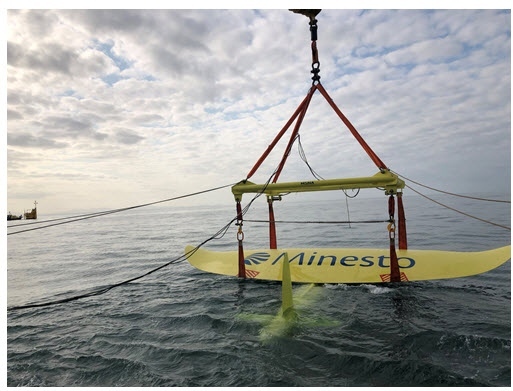 Minesto installed and commissioned a 500 kW tidal device at Holyhead Deep off North Wales, while CorPower completed a half-scale demonstration of their wave energy device in EMEC, and initiated the next stage involving full scale devices. In 2016, the Government together with several other political parties agreed on a long-term bipartisan energy policy for Sweden. The agreement includes a target of 100% renewable electricity production by 2040 and no net emissions of greenhouse gases in the atmosphere by 2045. Furthermore, a new Climate Act was introduced in 2018 which states that each government has an obligation to pursue a climate policy based on the climate goals adopted by the Riksdag. Additionally, in 2015, the Ministry of Enterprises, Energy and Communications enacted a national maritime strategy1), which identifies areas where action is needed to promote a sustainable development in the Swedish maritime sector. Ocean energy is one of many areas included. There is no national energy policy specifically for ocean energy. The long-term Swedish energy policy relies on economic policy instruments, including a carbon tax, international emissions trading and a renewable electricity certificate system. All these instruments provide incentives for renewable energy and do not specifically target a particular renewable electricity conversion technology, i.e. they are technology neutral. There are no instruments in place to specifically incentivise ocean energy deployment. The Swedish Research Council, www.vr.se, which, among other things, is tasked to fund fundamental research and expensive equipment for research purposes within a number of topic areas. Improved installation, operation and maintenance strategies. The Swedish Energy Agency is also involved in OCEANERA-Net Cofund, which is a collaboration between national/regional funding organisations and EU to support the ocean energy sector and fund transnational projects. A second call for proposals was opened in January 2019. Swedish companies, universities and institutes were involved with several research and development projects during 2018. Below are just a few examples. WECANet is the first pan-European Network on an interdisciplinary marine wave energy approach, with networking tools and activities. It is EU funded and will last for four years. It will provide a platform and forum for efficient cross-border networking, exchange of information and identification of strategic research needed to deal with challenges and knowledge gaps for promoting deployment, commercialization and advancement of the wave energy sector. Uppsala University participates. OESA is a 3-year project funded by the Interreg North Sea Region Programme. The aim is to support the accelerated deployment of large-scale pilots from ocean energy technology companies in the North Sea Region. Uppsala University will contribute with expertise in wave and marine current energy areas. The UMACK project started in 2018 and will address ocean energy affordability, survivability, reliability and installation through the demonstration of a generic anchor-foundation-mooring-connectivity system which aims to reduce capital and installation costs by up to 50%. The project is a collaboration between CorPower, Sustainable Marine Energy, TTI Marine Renewables, European Marine Energy Centre (EMEC) and Edinburgh University. The project has received support under the framework of the OCEANERA-NET COFUND project, with funding provided by the Swedish Energy Agency and Scottish Enterprise and co-funding by the European Union´s Horizon 2020 research and innovation programme. The project seeks to demonstrate that direct drive systems for wave power can be as efficient as large hydropower generators (98%), also in partial load and speed, and can be in the same size and initial cost range as existing gear box solutions. In the project, a specialized linear transverse flux generator is being designed and built in the lab. The project takes place at KTH Royal Institute of Technology and has received funding from the Swedish Energy Agency. The project is a collaboration between developers, research organisations and supplier, involving Chalmers department of Mechanics and Maritime Sciences, CorPower Ocean AB, Waves4Power, nkt Cables AB, Minesto and RISE Research Institutes of Sweden AB. The project started in 2015 and ended in 2018, with funding from the Swedish Energy Agency. The aim of the project was to develop a dynamic low voltage cable between buoy and floating hub. Tests were made in the laboratory and in the ocean at Runde. A mathematical model for power cables with fixings was developed to simulate the cable movements and to calculate the fatigue failure of the electrical conductor. New patent and knowledge derived from cables and accessories have been found. The deployments that have been made during 2018 have taken place outside Sweden. CorPower Ocean develops a compact high-efficiency Wave Energy Converters, inspired by the pumping principles of the human heart. In 2018 CorPower completed Stage 3 demonstration in Orkney, EMEC Scapa flow site. After 18 months of combined dry and ocean testing of the C3 Wave Energy Converter (WEC), CorPower and project partners have taken important steps towards proving commercial viability of wave energy. By verifying the ability to solve the two major challenges for wave energy, storm survivability combined with significant power production, a major demonstration milestone has been completed. This has been possible with the help of a novel storm protection mode, minimizing motion and loads, and a novel phase control technology called WaveSpring that amplify the motion and power capture performance in operational sea states. The programme was financed by Wave Energy Scotland, InnoEnergy, Swedish Energy Agency and Interreg Foresea. 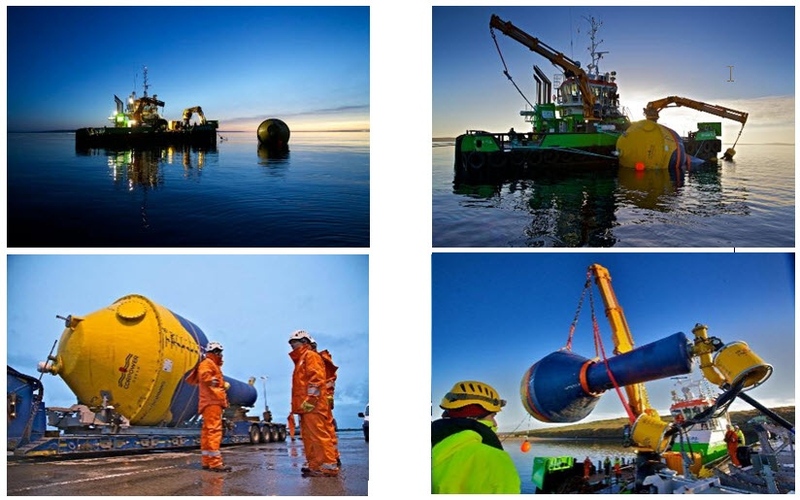 CorPower is the first developer to complete Stage 3 demonstration within the Wave Energy Scotland programme. Minesto develops a technology called Deep Green that can produce electricity from low-velocity tidal and ocean currents. In 2018 Minesto successfully installed and commissioned a 500 kW demonstrator at the company’s site in the Holyhead Deep off North Wales. A significant milestone for the company, as it meant Minesto verified functionality and achieved electricity generation with a unit at a commercial scale of its unique subsea kite technology. In parallel, prototype testing with a 3 kW scale model continued at Minesto’s test site in Strangford Lough, Northern Ireland. Waves4Power is a developer of a buoy-based wave energy converter system. They have been demonstrating their buoy in Runde, Norway. After completing an update of the WaveEL buoy, the system will once again be grid-connected to the local grid, tested and verified. In parallel there is continued development of a next generation buoy (WaveEL 4.0) using new materials and system optimization. During 2017, the demonstration project at Sotenäs in Sweden was ended. Seabased AB has an ongoing dialogue with organizations to use Sotenäs demonstration site as a test site. Unfortunately, Seabased AB has recently advised that they will liquidate one of Seabased AB´s wholly owned subsidiaries, Seabased Industry AB. This primarily affects the factory in Lysekil, which will be closed. Seabased AB intends to continue their manufacturing elsewhere. Stage 4 – Demonstration and prototype certification of single device full scale C4 WEC, planned for 2018-2021. Stage 5 – Demonstration and type certification of pilot array with three C5 WECs, planned for 2021-2023. The HiWave-5 project aims at having at least three operational devices demonstrated in the pilot farm by 2023, delivering electricity to the grid with certification of availability and performance. Several potential sites along the European Atlantic coast have been reviewed for HiWave-5, with Billia Croo in Scotland and Aguçadoura in Portugal remaining as main candidates. Final decision is expected in 2019. In 2019 Minesto plans to continue open sea demonstration with its 500 kW converter in the Holyhead Deep, Wales, with the purpose of demonstrating long-term testing and power production performance. Minesto also continues site development in Holyhead towards installation of more devices and going towards a commercial demonstration array with Minesto devices. Whatsmore, Minesto plans to install the first of two tidal stream installations on the Faroe Islands in 2019. The company signed a collaboration agreement with local utility SEV in November 2018, for two grid-connected installations of Minesto’s DG100 model as a first step of adding tidal energy by Minesto’s technology to the Faroese Island’s energy mix. Total installed capacity is approximately 200 kW. New Swedish legislation on Marine Spatial Planning (MSP) is in force from 1 September 2014. The Swedish Agency for Marine and Water Management is preparing the forthcoming national marine spatial plans. There are no pre-selected areas for oceans energy. Instead, there are national interest areas for offshore wind. Within areas of national interest, it is not allowed to undertake activities that can seriously harm the designated values or undertake activities that significantly complicate the intended use of the area. Permits according to the environmental code are granted by the Environmental Courts with the input from the County Administrative Boards. Ocean energy projects may also need consent regarding the continental shelf act. These applications are handled by County Administrative Board. The local County Administrative Board should be contacted and informed in the beginning of the process. A consultation will then be held between the County Administrative Board, the municipality environmental service committee and the person applying for permit. At the consultation there will be discussions about the planned activity, environmental impact and the future process. After that a consultation will be held with others particularly affected by the plans. If the plans. If the plans are likely to have a significant environmental impact it is mandatory to have a bigger consultation with other authorities. The next step for the applicant is to prepare an Environmental Impact Assessment (EIA) and send together with the application to Environmental Court (this should be made within one year after the consultation or a new consultation might be needed). The Environmental Court will then decide if permit is given (supplementary information might be required before). A granted permit is in turn associated with conditions that must be met by the applicant. It is also possible that the Environmental Court determines different compensation measures like a fish fee. Whether it is clear or not to applicants what permits are required, in what order and what information must be supplied at what time, depends on the applicant’s experience of earlier consenting process. There is no specific authority that manages the whole ocean energy consenting process (“one stop shop” facility or entity). Instead there are several authorities involved and they also manage other consenting processes. Currently an Environmental Impact Assessment (EIA) is always required. However, the level of detail and scope of necessary investigations naturally varies depending on the character of the project. This legislation is currently under review and it is possible it will be altered. Permits usually contain conditions regarding monitoring the environmental effects of the project. The consenting process for ocean energy is regulated by the environmental legislation in the environmental code (miljӧbalken). The environmental code is a framework legislation which contains certain special rules applicable to water-related activities. These provisions are however applicable not only to ocean energy but to dams, building bridges, traditional hydropower, etc. There are no special rules applicable only to ocean energy. No legislation and regulation have been adapted to better suit ocean energy so far. Swedish water-law is currently being reviewed and it has been suggested that more water-related activities are made subject only to notification and not a full permit-process. However nothing has yet been decided. A consultation is done early in the process. It is the applicant the entity responsible for its implementation and that it follows all rules. In the first consultation with the authorities there will be discussions about the planned activity, environmental impact and the future process. In the next consultation others particularly affected by the plans will receive a written invitation. General organizations and public are invited through an ad in the newspaper. Discussions will be about the location, scale, design and environmental impact of the activity all well as content of the EIA. In case of a bigger consultation, the identified parties will receive a written invitation. Statutory consultation is required with the County Administrative Board, municipality environment steering committee and others particularly affected by the plans. Of the plans are likely to have a significant environmental impact it is mandatory to have a bigger consultation. Information of the process is available on the homepages of the County Administrative Boards. The Swedish Energy Agency has also developed a website together with other government authorities which explains the consenting process for wind power plants, including offshore plants (only in Swedish). This site also includes web map service integrated with e-service for consenting applications. In both testing sites in Sweden, Lysekil wave power research site and Söderfors marine currents research site, there is no specific consenting process.